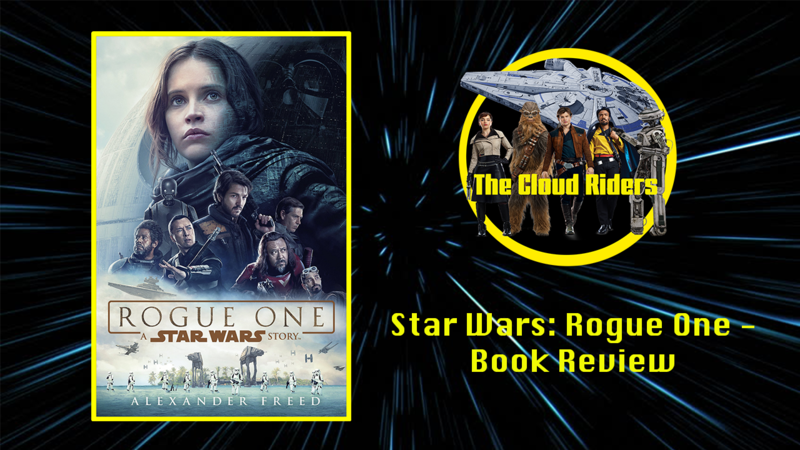 When writing a review for a film novelisation, I look for things that may not have featured in the film, or scenes that have been expanded on to further enhance the story; Alexander Freed’s second book in Star Wars Canon “Rogue One: A Star Wars Story” was full of extra moments that have complemented my views on the film. Readers will find out the motivations behind some of the characters actions, connective scenes that are useful with regards to continuity, as well as interactions from the movie that are expanded upon. Freed emotionally dives into the minds of some of the key characters throughout, and provides further insight into some of their actions and the resonance behind them. Jyn’s internal struggle about feeling abandoned by both her father Galen Erso and Saw Gerrera, Cassian’s conflict as he contemplates his orders from General Draven to kill Galen Erso, and also Mon Mothma’s feelings about the path the Rebellion is currently on. The book allows readers to spend more time with some of the characters that only featured briefly in the film, take Lyra Erso for example. During the first few scenes in Rogue One we see Lyra stand up to a group of Death Troopers whilst aiming her gun at Orson Krennic, despite knowing she could have run away with her daughter Jyn. It turns out that she had misjudged Krennic, expecting him to surrender in fear. With regards to the Empire, readers get more of an insight into how Tarkin took over the Death Star and Krennic’s thoughts as he discovers how easily he was played by Tarkin. As mentioned above, readers get to delve deeper inside the head of Jyn Erso, understanding her coping mechanisms with feeling rejected from Galen and Saw, and also how she came to trust and love the Rebel Alliance despite her rough introduction to the cause. There are also more conversations between Jyn and Mon Mothma that would have been great additions to the film. A lot of the new canon book feature several interludes and Rogue One is no different. One of the interludes reveals how Galen’s revenge on Krennic and the Empire is nearly discovered. Supplementary information like this is always good for a story and it adds another layer to everything viewers see when they sit down and watch Rogue One: A Star Wars Story. Movie novelisation’s are usually good for looking at scenes that weren’t featured in the movie, Freed provides and intimate look at Jedha as a whole, moments before the Death Star Strikes as well as an up close view of Pendra Siliu’s death when Jedha is destroyed (Pendra was the little girl Jyn saves when Saw’s Partisans attack an Imperial fleet). To conclude, Rogue One is a book that enhances the story rather than just giving readers a like for like printed account of the film. I would consider this book required reading as it provides a clearer and more insightful look into the events of the film, as well as showing the moments that weren’t actually captured on screen. For an even better experience with the book, read “Tarkin” and “Catalyst” both written by James Luceno that give background to Tarkin’s rise in the Empire ,as well as the beginning of Galen Erso and Orson Krennic’s relationship and how that lead to Galen joining Krennic on his project.